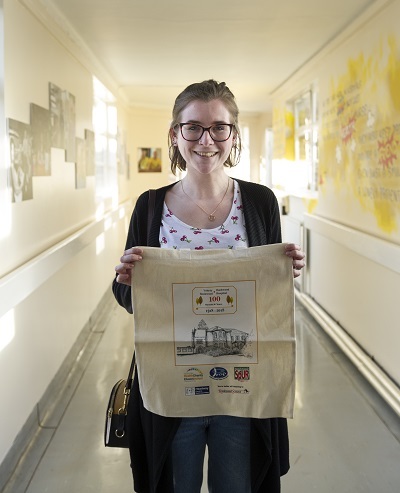 Artwork has been recently unveiled as part of celebrations to mark a century since the opening of the Rookwood Hospital in Cardiff and as part of the NHS at 70. Rookwood Hospital is a rehabilitation hospital in Llandaff, Cardiff. It is one of only twelve spinal rehab units in the UK. It is also a regional neuro-rehabilitation hospital as well as housing a geriatric day hospital, a geriatric intermediate care facility and a geriatric medicine rehabilitation ward. Rookwood was built in 1886 by the late Colonel Sir Edward Hill as his home, and subsequently Lady Hill, lived there until 1917. In 1918, it was taken over for use as a convalescence home. 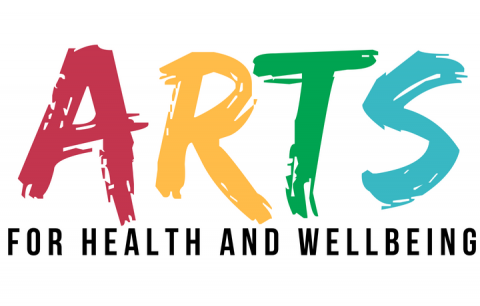 To celebrate a century of caring for people and keeping people well, a number of artists were commissioned. 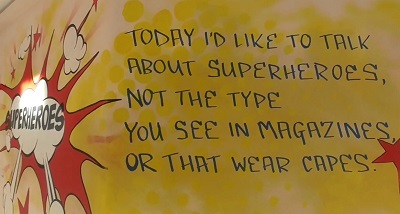 Regan Paddock, a patient who had been at Rookwood following a car accident, wrote a poem about the Superheroes of Rookwood, penned for the staff who looked after her. 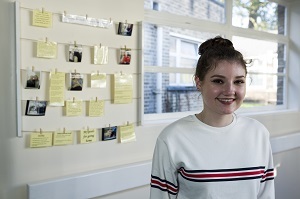 Regan tells us her story: “I was an A-Level student, I was really social, I went to parties, I went shopping with my friends. I was also a proper family girl too. “On the 10 February 2017 me and my friends were going to a barn dance, and the boy who was giving us a lift had been driving for just over a week. Me and some of my friends were in the car and I was in the front. We were driving around country lanes to get to the party and we went through a fence and into brook and landed on the nose of the car. Me and my best friends suffered really bad brain injuries. “They had to get the fire engines to cut us out because the car was so badly smashed up. So we were in the car for about two hours before we were out. Then comas followed. I was so disorientated wherever I went so I had to get used to a whole new place and my memory is so bad from my brain injury that I can’t remember where I was. I just woke up and couldn’t remember where I was. I had to get used to it all over again. “I’ve had psychology, speech and language therapy, occupational therapy and physiotherapy. Speech and language therapy helped with my swallowing and talking, psychology has helped with my cognitive skills, physio has helped with my mobility and occupational therapy has helped with my washing and dressing, doing things for myself and cooking. “I felt looked after and cared for by staff on the wards. It’s not just a patient/nurse relationship, I’ve created more than that with some of them, like a friendship. They look after me and care about how I feel. 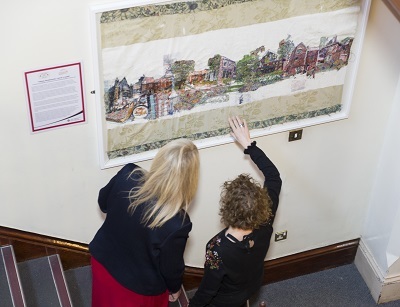 Artist Haf Weighton, who was commissioned to create a tapestry of the building, said the experience had made her look at the building through new eyes. 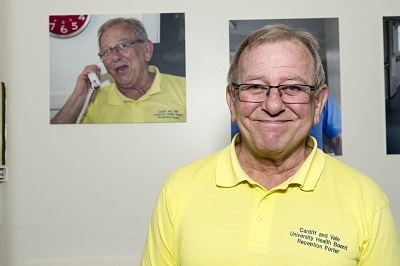 “I’m from Cardiff, so I know of the hospital, I went to school at Glantaf just around the corner but I didn’t really know much about it before. “It’s a beautiful building – there is a lot of colorful tiles outside and inside the building. “There’s a flight of stairs that goes right through the middle of the building, and there are a lot of gothic sections to the building – you wouldn’t necessarily notice the detail of the building as there are a lot of trees around it. “I had so much input from those working at the hospital, in the end, I created three separate pictures rather than just one. “I create pictures that are not exact copies of buildings – they are more of an interpretation about the feeling of the building. “There is a bell in the reception area of the hospital which a community in Porthcawl donated, all the staff recognise this bell so it’s important that it was included in the artwork. 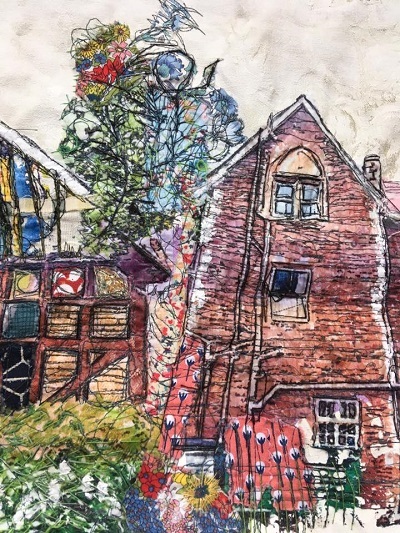 “I create tapestries, I use stitch, but also print and paint, a mix of different materials. “As part of the commission, I visited Ysgol Gyfun Gymraeg Glantaf and did a workshop with their students based on Rookwood. It was a busy time for Haf, as some of her works were on display at the Saatchi Gallery in London from 20 March until 1 April 2018. 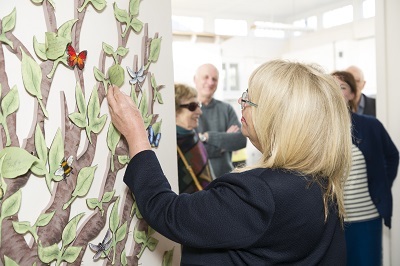 Maria Battle, Chair of Cardiff and Vale University Health Board attended the event and said: “I was delighted to be able to go along to Rookwood to meet everyone who contributed to the wonderful artwork and photos that are displayed around the hospital.